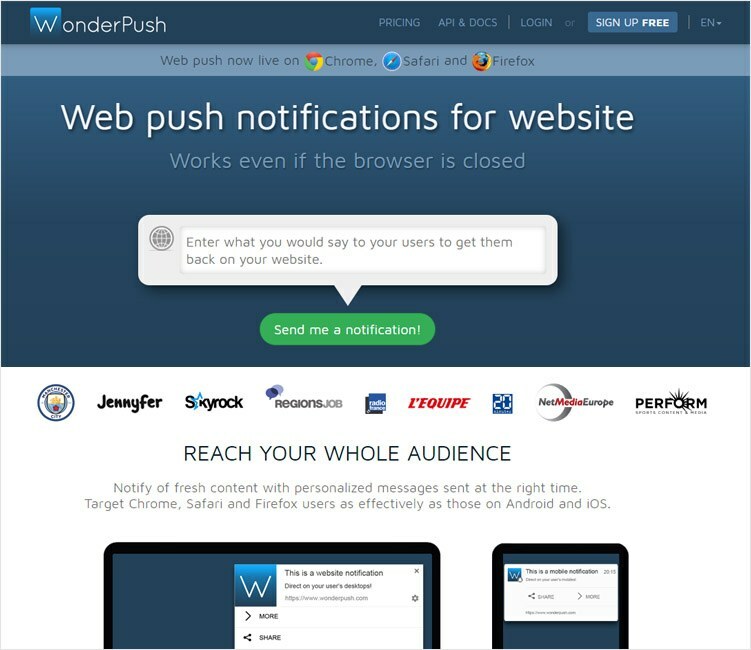 Browser push notification is a message your users get from a website, even when they are not actively on the site. The push notifications are send on the browser directly and it includes your message along with a picture. Push notifications is a modern way to get users back on your website. You can engage the users to your content by sending a simple push notification. They are effective as well, considering that we do not need the user’s contact information for marketing. All user has to do is simply click the ‘Allow Notification button’ on the browser when he visits your website for the first time. You can than send push notifications to your users easily. These days there are many browser push notification services providers out there, and each have their own sets of advantages and disadvantages. We would be comparing different options available in the market, you can choose the one that suits you best according to your requirements. Below is the comparison of some of the best Browser push notification services. Notification Count 5000 10000 Subscribers Free Free 25000 15000 Subs. Some push notification services allow only text push as notification. On the other hand some notification services allow push notifications along with text and image. It is better to go with the service which allows both content type of web push. Images have the power to increase your click through rate, so it is always ideal to go with the service which allows both type of content push. Web push notification services offer two variety of pricing either based on number of subscribers or based on number of notifications. With push notification, you can send at-least one notification a day and your customers won’t be mind it. If you have a large number of subscribers, it is better to opt for service which offers pricing on the basis of number of subscribers as with large userbase your notification count can expire quite fast. Your web push notification service should support maximum browser types and platforms. It is always better to go with service which allows you to send push notifications to multiple browser types so that you can cater as many audience as possible. Let’s now take a look at the 10 Best Web Browser push notification services – by the end, you’ll know exactly which one is the right option for you. 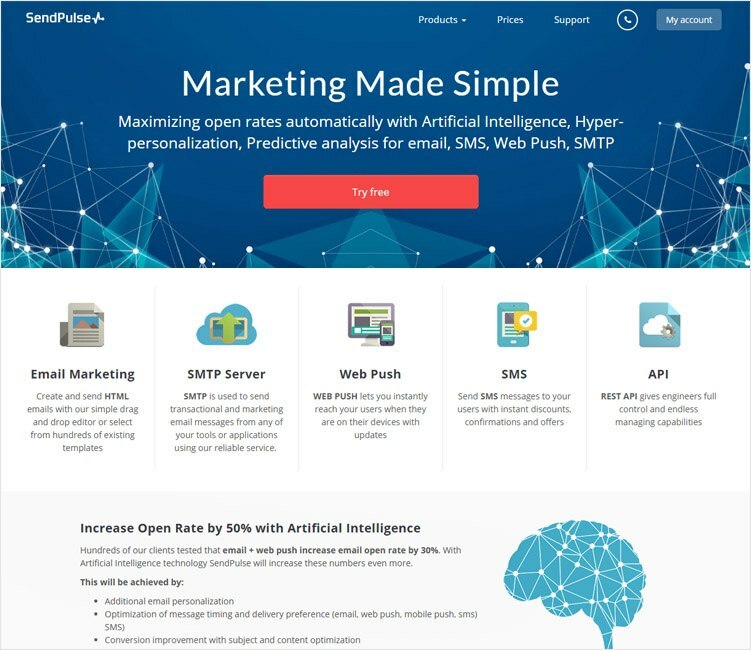 PushCrew claims that it can bring back customers to your websites using push notifications, and with clients like www.seo-hacker.com and www.hindustantimes.com, we can see that their strategy is working well. They support many browsers, including Google Chrome v.42 and above and Firefox v.44 on desktop PCs, and the Google Chrome on Android OS running smartphones. Add images to the notifications so your audience can see a vivid picture of what you’re offering to them and be more inclined to check your site out! You can group your target audience into segments and the notifications will only be sent out to the people who fall within the criteria. Izooto is used by many entrepreneurial beasts of India, including www.jabong.com and www.mahindra.com, which gives it zero space for error. And the fact that it sees over 25,000,000 clicks on its notifications proves that their campaigns are very successful. Izooto offers vast browser support e.g. Google Chrome, Firefox, Internet Explorer Edge AND Safari in desktop PCs! However, only Google Chrome is supported in mobiles and tablets. Notifications with Two CTAs i.e. call to actions are offered. Basically, you can show two actions which the user can undergo e.g. the option to either “sign in” or “sign up”. Offers multi-language support. The notifications language is customized according to your audience’s location. In-depth analysis of your campaign is offered for you to see the progress of your operation. The facility of re-targeting users is offered so even your usual traffic is prompted to visit again. 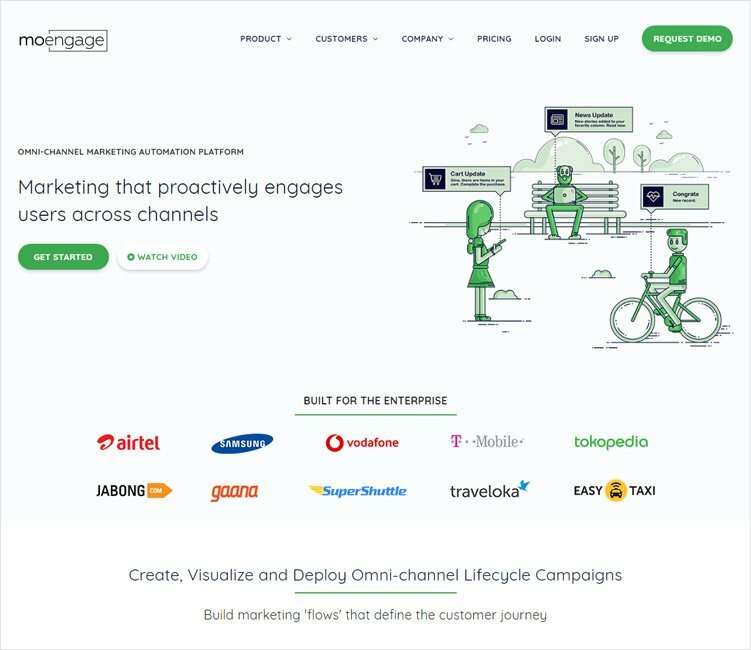 Used by businesses like www.snapdeal.com and www.airtel.in, MoEngage is a developing part of the push notification services providers. MoEngage only supports Google Chrome as of now, both on the desktop and mobile devices. However, they have a plan to introduce support for Firefox and Safari soon. With personalized notifications, be sure to have high conversion rates. I.e. the notifications are customized according to each audience! The best feature- the User Intelligence platform, which acts as an intermediary between the consumer and the business. Thanks to the advanced UI, users are presented notifications which are trigged behaviorally. E.g. Man A is about to purchase Bag x, he adds X to the cart. However, he does not check out. The business can trigger a push notification along with an image of the product or a discount code to bring in the customer again. SendPulse claims to present messages that are “hard to miss” and that their messages are a quick solution to get that window shopper to checkout! Offers compatibility with Google Chrome, Firefox and Safari on desktop PCs, and Google Chrome on mobile devices. Guarantees high level of subscriptions thanks to the web push request. 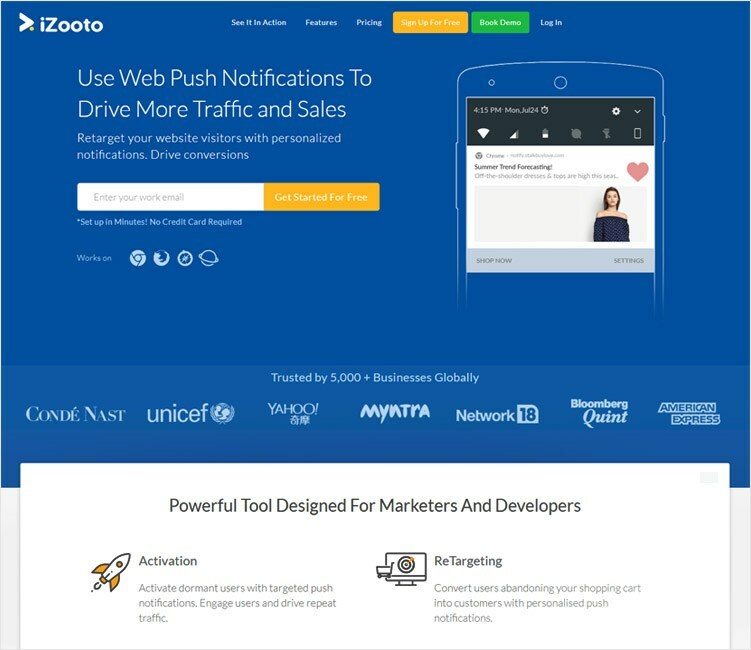 Users get notifications as soon as they are connected to the World Wide Web. The notifications can be segmented according to the user’s location and past usage i.e. customized notifications for each audience member. E.g. send notifications in various languages or according to the browser type i.e. whether the target is on a desktop PC or on a mobile or tablet. They also offer a developer API, which helps in integrating the push notifications into CMS, CRM and other systems. 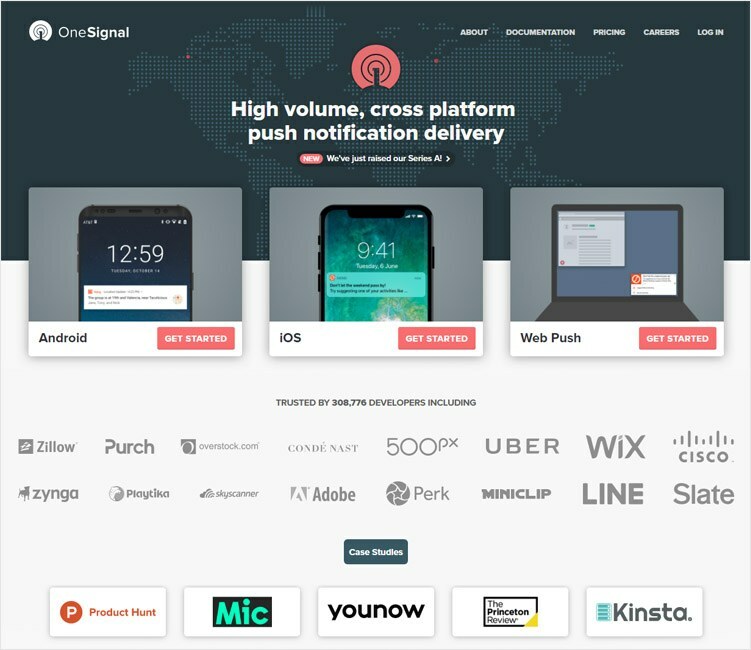 OneSignal has clients like www.uber.com and www.9gag.com , thus showing that they already have the trust of people and businesses alike. Offer support for Google Chrome, Firefox and Safari on Desktop PCs, while only Google Chrome is supported on Mobiles. They boast having an easy setup. Customer reviews have shown high appreciation for the initial setup only taking 15 minutes or less, and being incredibly user-friendly. It has the capability to real time track your conversions i.e. have a look at the amount of clicks your campaign has received yet. Not only does this encourage businesses to further take part in such campaigns, but it also pushes out any feeling of failure. They offer the ability to create personalized notifications varying with the user’s location and usage history. And to top it off, we can specify when we want the notification to show up! 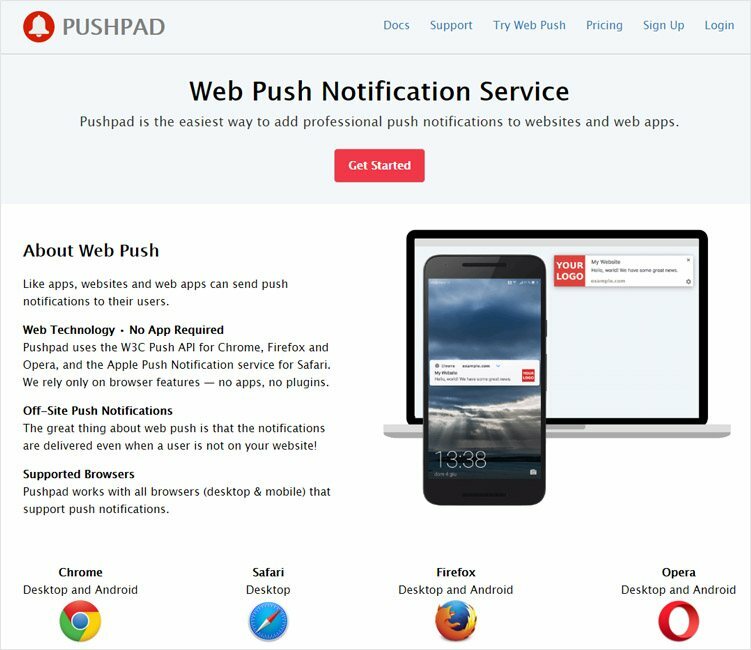 PushPad uses browser integrated APIs for sending notifications e.g. the W3I Push Notification in Google Chrome and Firefox and the Apple Push Notification Service in Safari. As stated above, PushPad supports Google Chrome, Safari and Firefox. They offer the capability to control notifications manually. Using the API you can also send automatic notifications to users. Also offers the RSS Feed integration. Gives analytical tools as well i.e. for us to see firsthand how our campaign is doing. Also works with WordPress e.g. to notify users when you make a new post. Their service, called PushPad express makes it easy for us to send out notifications as we only share a link with our subscribers after we start a new project. 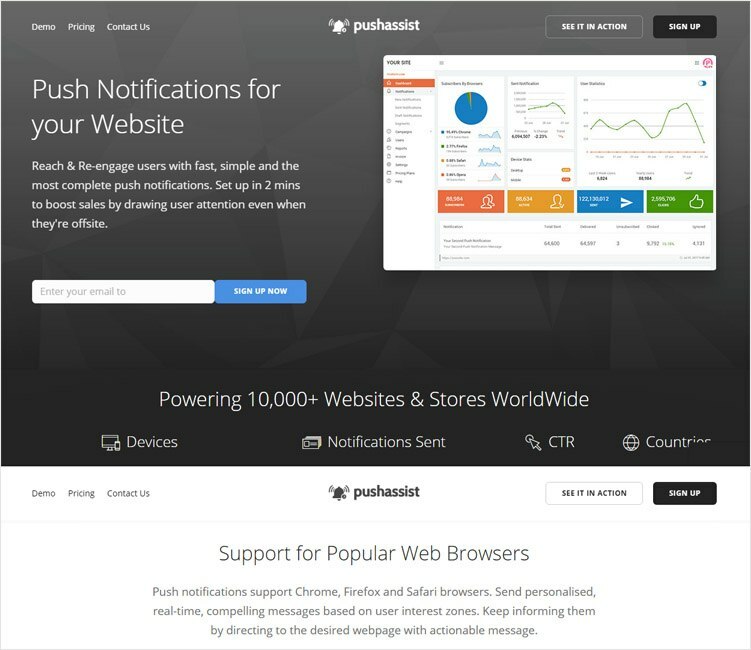 PushAssist has been dubbed one of the most user-friendly browser push notification service by many customers. Support Google Chrome, Safari and Firefox on Desktop PCs, and Google Chrome on Mobiles. Claims to have easy integration with WordPress, Magento, OpenCart, Drupal and GitHub. Notifications can be sent out just after 5 minutes! I.e. five minutes after signing up for the website you can start sending out notifications. Offer capability to real time track results for us to determine whether the campaign is successful or not. I.e. we can see the results live, how many clicks are coming in or how many users are now completing your desired action. Smart segmenting makes it easy for us to divide the notifications according to user’s properties e.g. regional differences, past usage etc. We can instantly divide our users into groups and send customized notifications to each user as per the segment in which they fall in. We can construct a message and then side by side look at how the message will be. This makes it easy for us to form messages as we know what exactly the customer will be looking at. They offer the capability to construct messages and automatically send them out. PushWoosh has been dubbed one of the best browser push notification services provider out there. The fact that they send out almost 250,000 notifications within a single day proves they have a strong base! We can segment users in order to send out notifications that are personalized and thus more appealing. Provides statistics for us to see the progress of the campaign. Gives multi-language support so that the user sees what he/she understands. Notifications are sent out keeping in mind regional differences i.e. will only be sent out when users in a specific region are most active. Auto-push notifications after segmenting users into groups and setting up the preferred frequency. Build messages rich with media to appeal more to the audience and ensure that they perform the desired action, be it clicking on the notification or signing up for your newsletter for example. With clients like www.lequipe.fr, WonderPush is a much-appreciated push notification service provider. Support Google Chrome, Safari and Firefox. They claim to work even when the browser is closed, but internet connection is active. E.g. a notification prompting users to visit your website again or to checkout and complete their order. Offer the capability to send out 350K notifications per second. Targeting notifications using segmentations of users is also offered. E.g. notifications are customized according to user’s location or language or past usage. We can send out welcome messages too e.g. when a user downloads our app or signs up. 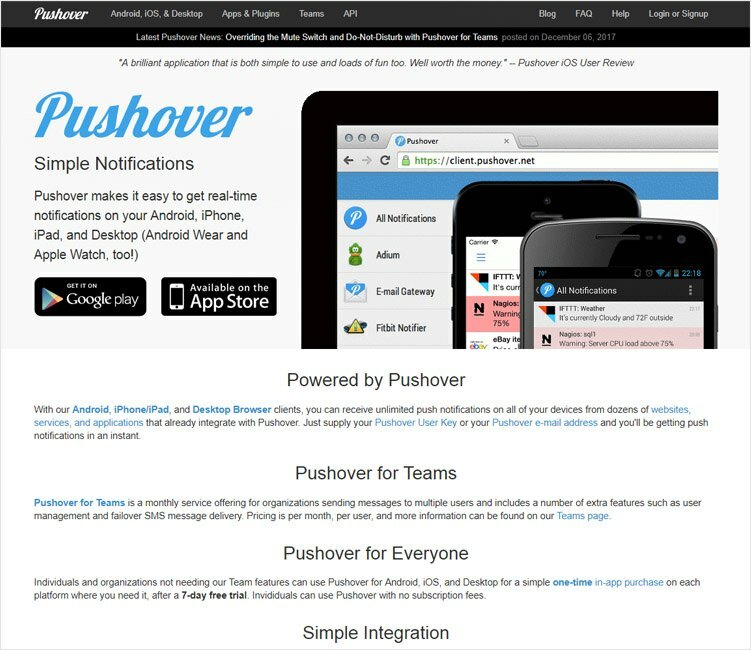 Pushover is the browser push notification services provider which probably supports most platforms, including Android phones, iOS running phone (iPhones), iPads, Desktop PCs and smartwatches such as Android Wear and Apple Watches too. Many existing apps and web services already have pushover integration to help you get started easily. The API pushover gives makes it easy for developers to integrate it into their own websites or apps, and thus make us able to send out notifications to hundreds of thousands of users. They give apps on the Google Play Store and on the iTunes store for customers to download and specify which notifications they want. All of the above browser push notification services are good in their own fields, many have clients who are huge multinationals and thus almost all of them receive huge revenues. Many businesses have accredited higher sales or conversion rates after the usage of such services and therefore they are highly recommended to everybody willing to give them a try! And considering almost all of them are open for a 14 days free trial, what’s the wrong in trying out, right? 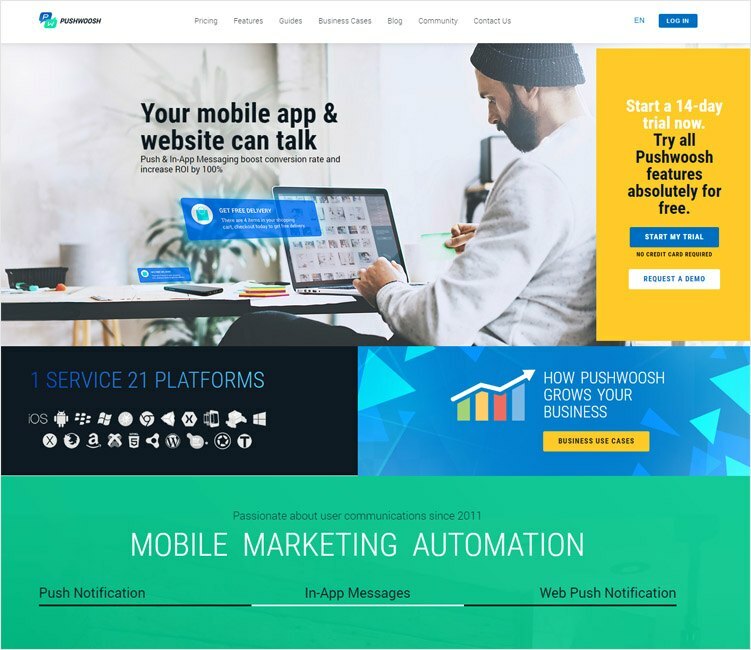 We researched on multiple web push plugins and we personally found PushCrew to be the best among the crowd. Since PushCrew allows you to send notifications with both text and image content type, it gives you the best click-through rate. 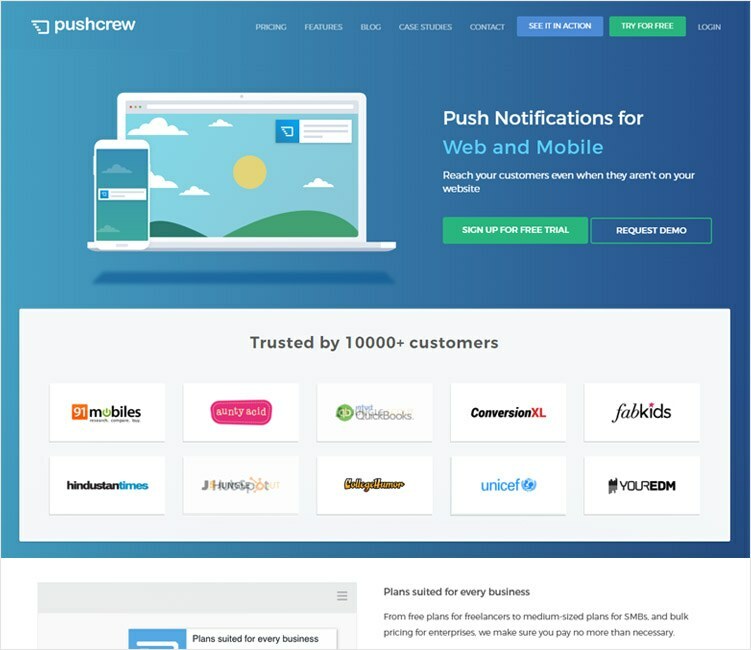 Also, Pushcrew support multiple web browsers which means you will be able to send notifications to all your customers without missing heaps of them. If pricing is your main concern, you can also opt for a different service, which according to us is a huge value for money. Since, using those services you would not have to shell out any money from your pocket. These all websites are best for push notification. can you mention notifyvisitors.com, if anyone looking the web push notification service? you can try this. All software are really a good software for browser push notification, thanks for sharing a valuable and awesome list of browser notification software. adpush.adrack.com is also another great web push notification website to consider.